This is a journey of a lifetime…a journey into your deepest self, inspired by breathtaking vistas high in the Swiss Alps. As we settle into our chalet, we create a haven from the routine, the over scheduled and the pressured lives we lead. We will be asking the Big Questions we don't often make time to explore. The remote location almost beckons us to come alive with possibility and purpose. Join us, and a small group of like-minded people who wish to dedicate this time to cultivating greater meaning in their lives. Stacy & David, having years of experience working with people and leading tours, create an atmosphere of acceptance, warmth and fun. Their passion for your transformative journey is palpable. You will find your old limiting stories melt away as you ponder important questions, open up to fresh perspectives, possibilities, and meaning. We want to set you on the path for living your life the way you’ve always wanted. We will begin our journey with a tour through the Large Hedron Collider facility at CERN in Geneva. Here we begin to explore the paradigms we construct for ourselves…how some constructions limit us…and how quantum mechanics can help us shift out of confining self-beliefs. Most of the week long retreat will be spent living high in the Alps. Nestled in the simple comforts of the chalet called "Singing Silence," we continue the inward journey of discovery, clarity and inspiration. Our days will include journaling, exercises, meditation with singing bowls, dream work, watercolor painting, and guided walks with breathtaking views. There will be ample opportunity for both solitary time and shared group experiences. David & Stacy encourage each participant on their own unique journey, even as our shared experiences create meaningful bonds among the group. Pierre Predervand’s book, “The Gentle Art of Blesssing,” is a book of inspiration for this retreat. As the chalet owner and a prolific retreat facilitator himself, he has prepared the way for us beautifully. This retreat is not for everyone, yet it is an experience you will never forget. The group is limited to a maximum of 10 people. 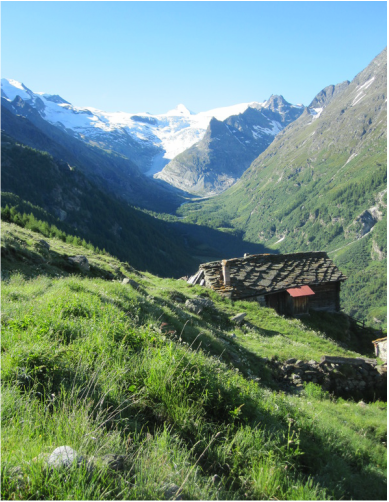 We will all meet at the airport in Geneva and load into a rented van to drive to through three cantons of French speaking Switzerland where we will park our van and hike up to the chalet. The personal belongings you do not need at the chalet can be left in the van, but the rest you will carry as we climb up out of the valley on a series of narrow roads and trails to reach the chalet. The distance is less than two miles, with a 500 ft elevation gain. Depending upon the winter, there could still be snow on the ground. We will be living as a family, making meals together, sharing meals around a table. Sleeping arrangements are in a large upstairs room.​ Beds and pillows are provided, but you should bring a light sleeping bag. The experience will help us realize how comfortable and light simplicity can feel. We will be living off the grid, using solar panels for lighting, a propane oven & stove for cooking, and a glorious 17th century heating wood stove. Pierre named his chalet "Singing Silence" to help set the tone for what happens to you when you stay at his chalet -- your spirit will be singing and you will be enthralled by the silence. We would love to welcome you! June 16th~ Leave from the United States (unless you are already in Europe). June 17th~ Arrive GVA (Geneva Cointrin Airport) by 8:00 am. You must book a flight that arrives in Geneva by that time. We have a reserved tour of the CERN (The Center for European Nuclear Research) facility near the airport. This is an incredible opportunity to experience firsthand man's explorations into particle physics and efforts to understand "reality." 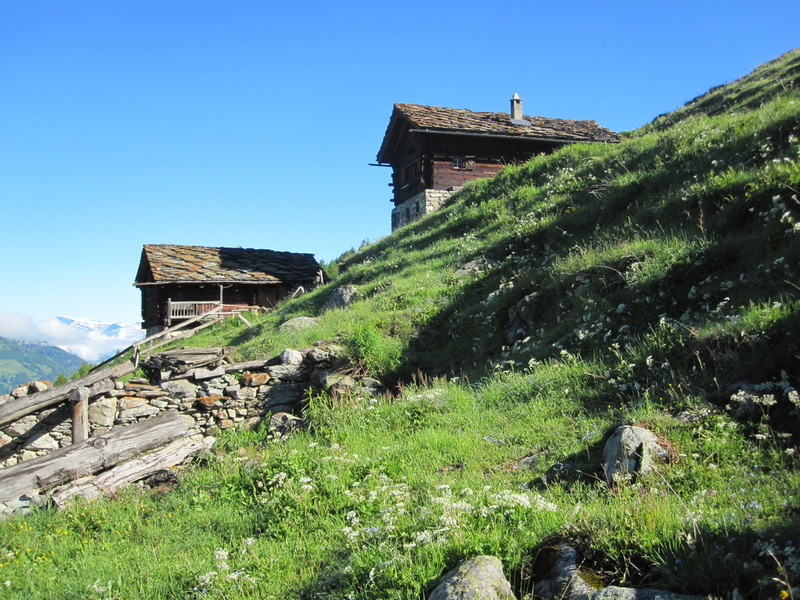 We will then drive to the small village of La Forclaz, in the Canton of Valais. If time permits we can stop en route and visit a unique cathedral. June 18th-June 23rd~ Spend five days and six nights at "Singing Silence" chalet. 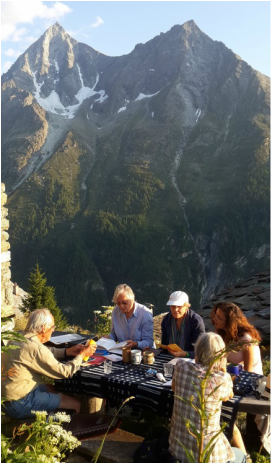 We plan on singing bowl meditations, dream work, journaling, guided meditations, watercolor painting, walks among the chalets and upper pastures and even to the pass overlooking the next valley, time for individual reflection, and evening sharing. June 23rd-June 24th~Leave the chalet on the 23rd with all our gear, loading up the van to start our trek back to Geneva. We will likely spend the night at a hotel & have dinner in one of the French speaking cantons (To be determined) so that we have time to visit a small medieval church with great acoustics and also visit a medieval castle that inspired Lord Byron before returning to the airport in time to make late morning flights back to The States on Friday, June 24th. Includes food, transportation, and lodging from when we leave the airport to when we return.